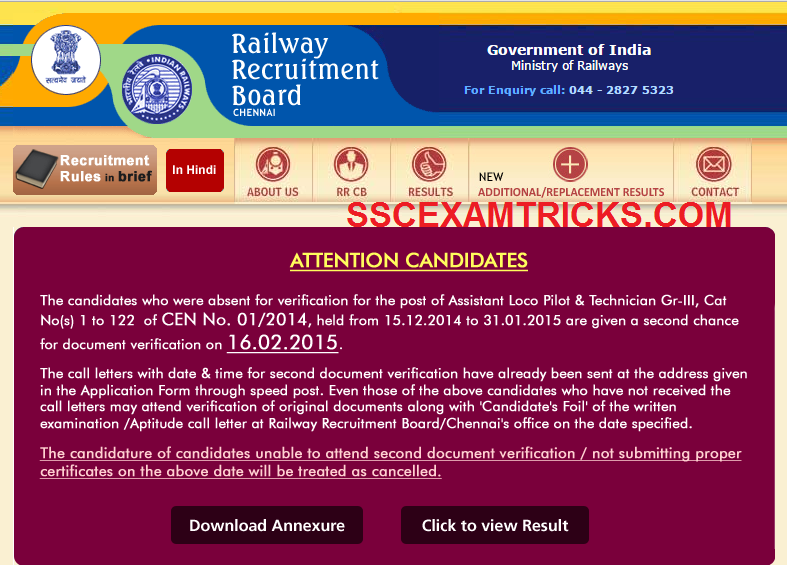 Railway Recruitment Board (RRB) Chennai has released the notification for absentee candidates in document verification schedule from 15th December 2014 to 31st January 2015. These Absentee candidates can attend second chance of document verification schedule which is going to be held on 16th February 2015. Earlier, RRB Chennai was conducted on 15th June 2014 and 13th July 2014 for the posts of Assistant Loco Pilot (ALP) against Advertisement No. CEN NO. -01/2014 Category No-01 to 122. The Aptitude test was conducted on 09th October 2014 to 15th October 2014. The short listed candidates was called for document verification according to their roll numbers (roll no. wise). · Download the Final Result in PDF. The written exam for RRB ALP 2014 was conducted on 15th June and 13th July 2014. The qualified candidates of written test were called for aptitude test which was conducted on 05th to 15th October 2014. The document verification of candidates was held 15th December 2014 to 31st January 2015. Now Final Selected candidate will have to get appointment letter which will be issued by RRB. The date of Joining and reporting venue is mentioned on the appointment letter. Candidate must bring original documents along with a photocopy set of original documents such as 10th, 12th, Graduation, Diploma or others along with domicile and caste certificate. Candidate should bring two passport size photographs at the time of getting appointment letter of Assistant Loco pilot (ALP) Posts. Candidates are advised to bring at leave two coloured photograph, 2-5 blank A4 size paper sheet at the time of getting appointment letter/joining to the station (for writing joining application).